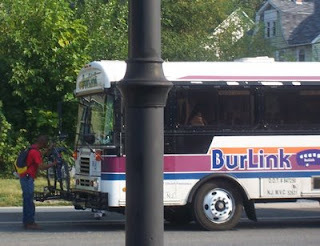 Effective Monday BurLink the (mostly) bike accessible bus service in Burlington County NJ is doubling fares as of Monday March 2. For those who want to transfer to NJ Transit buses or the RiverLINE the free transfer will become 50 cents-effectively raising the fare from $1 to $2.50, a 150% increase. This is an ironic twist in the stimulus bill. Congress pours billions into capital funding in fact SEPTA has $200 Million lined up for infrastructure improvements. But the operations funding required to keep the buses running (and bus drivers employed) amounted to zero. The service already suffered through a round of service cuts last year. The downward spiral has begun. I'm a fan of BurLink, there are not many wild places left in our region and there are even fewer ways to get there. But BurLink's B1 Bus runs hourly from the Beverly RiverLINE stop to Country Lakes Estates which is about 2 miles from the entrance to Brendan T. Byrne State Forest. Just beware of sugar sand if you plan on mountain biking.